In the last instalment, we looked at building a list control for Media Center. This introduced the ModelItem class, which is the basis for building the Model/View-Model in a Media Center application. With a reasonable amount of MCML now under my belt, I am shifting focus to the add-in itself. This article is designed to provide an overview of the add-in, with the topics introduced here to be the subject of upcoming posts. 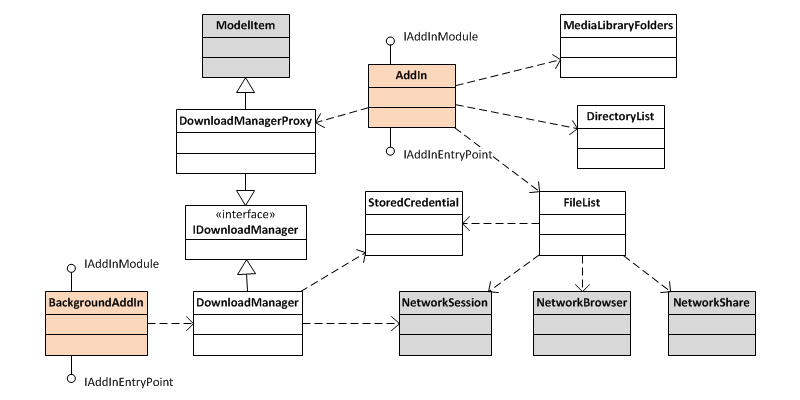 Architecturally, we need to break the add-in into two separate parts (entry points); one for the interactive portion and one to run the download manager. When the user navigates away from the interactive part of the add-in within Media Center, that process will be terminated, whereas the background process will persist. This technique is quite permissible under the Media Center SDK; it simply involves creating two different classes which implement the IAddInModule and IAddInEntryPoint interfaces, then specifying these in the registration XML file. In the diagram above, these are represented by the AddIn and BackgroundAddIn classes. Even though both entry points are located within the same assembly, the fact that they are instantiated in separate processes means that some kind of inter-process communication is needed to communicate between them. Previously, I have used .NET Remoting in order to achieve this, however the need to explicitly extend MarshalByRefObject combined with the complexities of getting singletons to work has led me to switch to Windows Communication Foundation (WCF). Although WCF doesn’t support events like remoting does, it requires only a service contract (in the form of an interface, in this case IDownloadManager) to start serving a type (DownloadManager) remotely. (And although events aren’t supported, we can simulate their behaviour by using callback methods, which are supported.) In this design, we wrap the remote instance in a class which inherits from ModelItem, DownloadManagerProxy, so that we can bind its properties to the MCML markup on the interactive side of the add-in. The service contract, proxy class and callback mechanism will be the subject of a future article. The background portion of the add-in is responsible for managing downloads which are initiated from the interactive side of the add-in. The DownloadManager class maintains a queue of DownloadManagerItem objects, which represent the source, destination and status of files. When a new item is enqueued, the queue is processed asynchronously. The built-in WebClient class is used to copy the files themselves – I chose this over the copy methods in System.IO because the web client offers progress notifications. The implementation of the DownloadManager class will be the subject of a future article. As touched on briefly, the NetworkSession class is used to access password-protected shares using credentials. It does this through impersonation, temporarily taking on the identity of the user represented by the credentials. For convenience, the add-in will retain credentials entered by the user. Since the built-in NetworkCredential class stores passwords in clear text, I designed the StoredCredential class, which holds the same information in a serialisable form, but encrypts passwords using the RSACryptoServiceProvider. Encryption provides obvious benefits, and using the crypto service provider adds the extra advantage of not having to manually create/store an encryption key – this is handled transparently by Windows. The implementation of the StoredCredential class will be the subject of a future article. Provides the basis for the NetworkSession class, which allows the logged-in user to impersonate another user, given a username and password. Until the object is disposed, all normal I/O operations (System.IO) on password-protected UNC paths will use those credentials. Used to obtain the list of computers on the local network; this code essentially does what the command-line NET VIEW tool does. Does not always include the local host, so I add it manually. Exposes parts of the Win32 API that enumerate network shares, given a computer name. Can distinguish between file shares and other types of shares. Provides the basis for MediaLibraryFolders, using a combination of PInvoke and Registry access to obtain the physical locations of the libraries used by Media Center. The next instalments will focus on the implementation of the design introduced in this article. Posted in Announcements, Windows Media Center.Tagged C#, encryption, interfaces, Interop, media center, networking, WCF, Windows Registry. © 2019 Brad Smith’s Coding Blog, all rights reserved.